Warwick – The more than 2,300 dogs licensed in the Town of Warwick have some very good friends in Florida Girl Scout Cadettes troop 571. The scouts are spearheading the efforts to create a 1.2 acre dog park at the town park at Union Corners. It will allow the community a safe social location for dogs as the troop works to achieve the Silver Award, the second highest any scout can receive. “The Girl Scouts decided the fenced in area would allow dogs to be off leash and keep the kids safer who were playing in the nearby fields,” said Heather F. said a Cadette involved in the project. A large fund raiser, “Bark in the Park,” will be held Saturday at the park to help raise the $16,000 needed to build a dog park with an agility course and separate off-leash, fenced-in area for dogs over and under 30 pounds. With nine out of the 11, Cadette-level Girl Scouts owning dogs, the idea seemed like a good one to enjoy during and after the project was over. “We all thought it would be a good project since we all love dogs,” said Alyssa K., one of the Cadettes who serves as project leader. The park is expected to open late summer or early fall of 2010 to all Warwick residents. “I think a dog park is a great idea, it offers a safe environment and a place where we can socialize with other dog owners,” said Jennifer McDaniel, a local Warwick resident who owns three dogs. Currently the closest dog parks where leash rules are suspended are located in Mt. Sparta, N.J., West Milford, N.J., Wantage, N.J., and at Orange County’s Thomas Bull Memorial Park in Montgomery. “Since there are no dog parks in the immediate area like Chester or Vernon a dog park may bring more traffic to Warwick so businesses may see more customers,” said Dina Kamrowski, co-leader of the troop. At the visits to the dog park the Cadettes found people from neighboring towns such as Goshen, Chester, Middletown and Warwick who wished there was an alternative. Also, it will allow those who no longer play sports or have children to utilize the town park. Through a number scientific studies the benefits of owning a dog are numerous to the owner and the animal. Owning a dog can reinforce the need for exercise in both the owner and the dog, reduce blood pressure, and increase resistance to disease, as well as unconditional love and companionship. These benefits are even more important to the elderly who often are unable to give enough exercise with daily walks to the dog but can offer them some off-leash play at sanctioned dog parks. “The exercise and interaction is a benefit for all dogs,” said Heather F.
The town sanctioned park will help enforce state laws which require every dog to have a license, be on a leash unless the area is reserved for off-leash play, among other safety issues addressed by the park rules and regulations. “We all plan to use the park as well as help to maintain the grounds when we visit,” said Carley M., another Cadette involved in the project. As part of the research portion of the project, the Cadettes found out most Warwick dog owners were traveling to other Orange County parks. 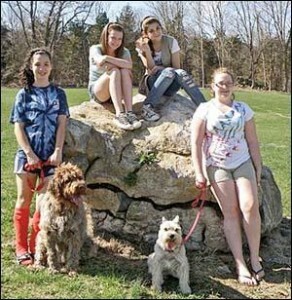 The residents were visiting Hickory Hill Park on Route 17A in Warwick where dogs are only allowed on leash. Often this law is broken and dogfights are a fear of many park attendees especially when there is more than one dog in a pack. “In the past year or two there has been a significant increase of ‘dog-on-dog’ attacks,” said Barron. The incidents occur mainly due to people not abiding by the leash laws and the lack of sanctioned dog parks where owners self-regulate as well as the presence of park officials. According to Shari Forst of Canine Case Squad, a behavioral and training organization located in Florida, dog parks are a good thing if you know your dog and can offer the opportunity to encourage socialization. The troop project is part of their Silver Award, which requires the Girl Scouts to develop a program that solves a community issue, and provide at least 30 hours of service toward the project. Each girl takes on leadership hours to develop a specific aspect of the park. They have taken on the construction of the agility course, benches and dog pots (areas with bags for owners to clean up after the dogs). What is a Behaviorist? What do they do?